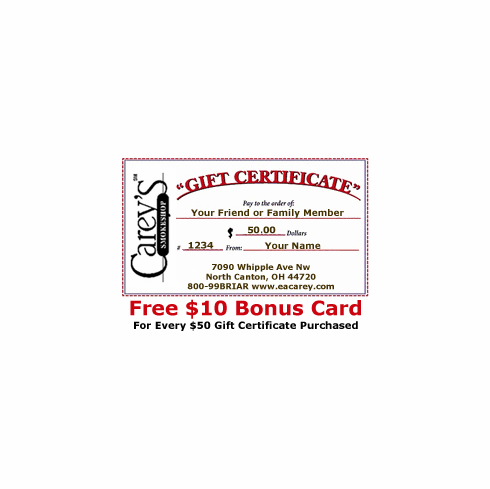 Free $10 Bonus Card For Every $50 Gift Certificate Purchased!! 1. Enter your name in the "From" field. 2. Enter your e-mail address in the "From E-mail" field so we can CC when emailing the gift certificate. 3. In the "To" field, enter the recipient's name. 4. In the "To E-mail" field, enter the recipient's e-mail address. If you wish to personally deliver or mail a Gift Certificate, enter your e-mail address here. 5. Enter the mailing address in the "Address" fields. Even if you are selecting to have the gift certificate emailed, please fill in the address information as a precautionary measure in case the e-mail is undeliverable. If you wish to personally deliver or mail a Gift Certificate, enter your mailing address here. 6. Choose the Format for your Gift Certificate: Regular Mail or E-mail. 7. Click the Order button. You'll immediately go to your Shopping Basket where the Gift Certificate amount will appear. 8. Be sure to select Gift Certificates Only as your Shipping Option. Including a Gift Message: If you wish to include a message to be sent along with your Gift Certificate, please enter it in the Comment field located on the order form. To purchase more than 1 gift certificate in increments of $25 just change the quantity after clicking on the order button. If you have further questions about purchasing a Gift Certificate, please e-mail us. Click Here To Redeem Your Carey's Smokeshop Gift Certificate or Pipe Trade-in Voucher.